On Sunday I came across a review of this new diet book called The Big Fat Surprise and immediately became engrossed by Nina Teicholz's arguments that butter, cheese and steak are part of a healthy diet. I was completely floored by her interviews and some of the excerpts from her book in a few different reviews. 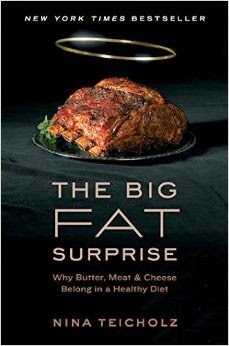 I know you might think that I'm biased against things like butter, cheese, and steak because I personally try to avoid them; but my problem with the overall message behind The Big Fat Surprise is that it seems to mislead the public into believing that a t-bone steak topped with a nob of butter is a healthful food. It's not. The book is already a New York Times best seller and it's about to launch in the UK. I was in such a frenzy the other day over Teicholz's arguments that I knew it was something I had to share with you guys. So here are a few things I got beef with. First, there are two types of cholesterol (good & bad) and our bodies naturally produce both types, which is important for healthy function. Our bodies also produce all the cholesterol it needs and the only other way that cholesterol gets into your body is by eating things like dairy, meat, poultry, eggs and seafood. Vegetarian foods do not contain ANY cholesterol so you can't add cholesterol into your body through grains, legumes, veg, fruit, etc. If you consume too many foods that are high in cholesterol you put yourself at risk for developing high blood cholesterol, which puts you at risk for heart disease (AKA heart attack). This quote is misleading because saturated fats alone and total cholesterol may not be a predictor of heart attack risk, but eating a diet high in animal foods (which naturally contain saturated fats, even the lean kind) does put you at risk for developing heart disease. In this interview with Paleo Magazine Conversations Teicholz says that there is a lot of evidence that suggests a high fat low carb diet is better for health and "if somebody were to show me contrary evidence to that, I would have to consider that. I think any of us would." Okay, why hasn't she considered the work of Dr Mark Hyman, Dr. Dean Ornish, Dr. Neal Barnard, Charlotte Gerson, or Dr. Joel Fuhrman, to name a few, who have all proven that by limiting/removing high fatty animal foods from a diet improve diseases? Teicholz is promoting a diet high in saturated fats through animal products (butter, cheese, steak); however, there is a large body of evidence that suggests a diet high in these kinds of foods can contribute to heart disease, diabetes, cancer, stroke, and more. And when asked about Colin T Cambell's The China Study, a respected nutritional study whose findings contradict her own opinions, she tries to disqualify it. She argues that the study shows an association between animal foods and diseases like cancer and heart disease, but does not prove that animal foods cause diseases. I would argue that perhaps there isn't proof to suggest causation, but Americans are eating more animal proteins then ever before. Ever since the Atkins revolution, high protein diets are commonplace and yet we are getting sicker and fatter. Why? In the same interview, a viewer asked Nina about the importance of fiber in a diet and how a low carb diet leads to insufficient fiber. She basically said she supported Gary Taubes conclusion that "the science doesn't exist to show you need fiber from fruits, vegetables and grains to be healthy." "It is not the fiber extracted from the plant package that has miraculous health properties. It is the entire plant package considered as a whole, containing nature's anti-cancer nutrients as well as being rich in fiber. High-fiber foods offer significant protection against both cancer (including colon cancer) and heart disease. I didn't say fiber; I said high-fiber foods. We can't just add a high-fiber candy bar or sprinkle a little Metamucil on our doughnut and french fries and expect to reap the benefits of eating high-fiber foods.". I think I'm going to have to buy this book. Like Nina, I too believe it's good to read what the opposition is saying even if I absolutely disagree. I completely understand if people are not willing to give up summer BBQ chicken or French brie, because it's hard. It was hard for me and I've been on this gradual journey towards vegetarianism since 2005, but it's not been without hurdles or regression. I was also raised in a Latin home where food is deeply rooted in tradition and that's hard to shake. However, there is compelling evidence out there that eating a high protein diet, especially in rich foods like steak, bacon, and cheese, is dangerous to health and omnivore Michael Pollan said it best, "eat food, not too much, mostly plants." Just what killed Dr. Atkins?